Health and wellness is now a $4.2 Trillion dollar industry, having experienced almost 13% of its growth in the last two years. Suffice it to say, it’s booming. And a 30 second scroll through your Instagram feed may lend a theory as to why. Think back to circa 1990. You’re sitting on the couch watching the TV. It’s about 1:30 in the am, and up pops Suzanne Somers and her iconic ThighMaster. For the next five or so years, you could glimpse a ThighMaster – stuffed next to a TV or behind a couch – in pretty much any house you stepped foot into. It was a hit! But fast-forward to almost 30 years later and times have certainly changed. Although the days of celebrities peddling wellness products on TV are not gone, there’s been a huge shift in how fitness gurus, nutritionists and others in the industry market their products. Instagram and Twitter have had a lot to do with the shift, and have also had a hand in fueling the growth of the health and wellness industry. Here are a few reasons why: you no longer need a celebrity spokesperson or expensive TV ad to market a product. Also, the engaging nature of the platforms – i.e. the ability to let real people talk about your product or service – makes Instagram and Twitter a health and wellness marketing goldmine. Hashtags are the icing on the Twitter and Instagram cake. They allow marketers to get their content in front of their ideal audience. Learning to use the best hashtags will also help marketers get their content seen by the most people. But the question remains, what are the best hashtags to use for health and wellness marketers? Whether you’re a gym owner, fitness instructor, or supplement distributor, use this round up of hashtags to boost your product or services’ discoverability. You may have seen the term UGC trending around the internet. UGC (user-generated content) is content created and shared by users, customers, participants, etc., and then collected by a company to use for future marketing. Here’s an example: You may remember P90X – the hugely popular fitness program by Beach Body. 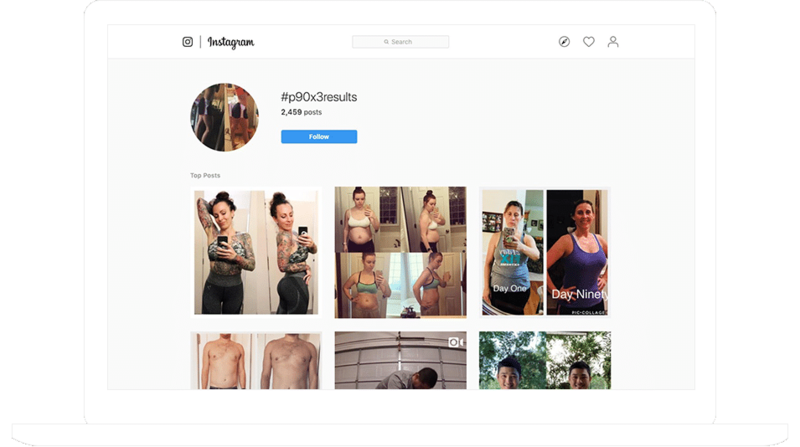 If you search for the hashtag #p90xresults, you’ll see posts of real people with the real results they achieved from following the exercise regimen. In marketing, having visual testimonials such as these is as good as it gets. Using an engaging medium, such as a contest or giveaway, to collect UGC is a great way to create a custom collection of content beneficial to your marketing needs. Furthermore, requiring the right hashtags in your contests helps collect the most relevant content. For example, in the #p90xresults example, the hashtag is specific to the results achieved with the program. If you simply searched #p90x, you’d probably see all kinds of posts unrelated to results – from post-workout sweaty selfies to plates full of broccoli – and who knows what else. When running a contest, giveaway, or promotional campaign, think of something specific you’d like your audience to put into photo or video form. In the following example, participants were asked to participate in the #slowmochallenge – i.e., to film themselves doing any activity in slow motion. 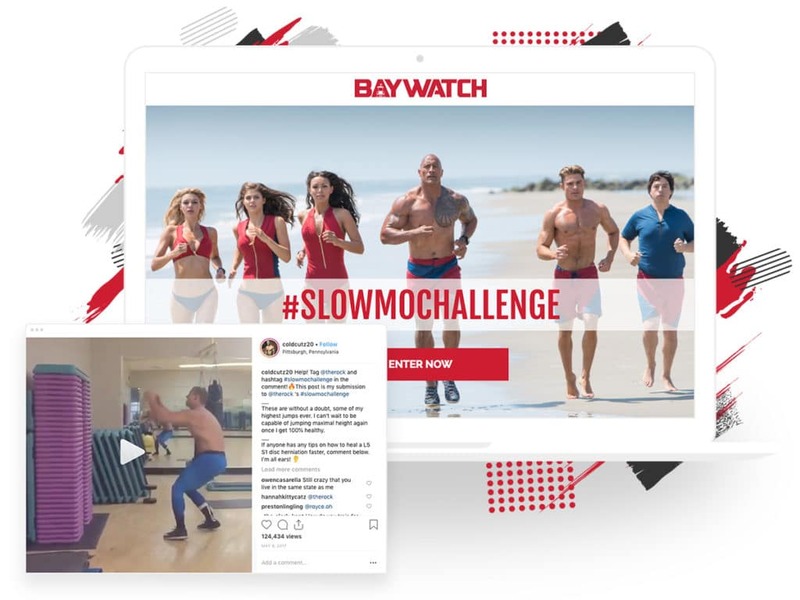 The campaign used the hashtag #slowmochallenge to build a feed that collected all of the entries into a gallery displayed on a landing page. The #slowmochallenge was not a contest or giveaway – it was used purely to build hype. But a campaign like this is could easily be turned into a contest or giveaway, which could boost participation and generate leads. If building a hashtag contest or giveaway sounds appealing, we have loads of templates to help you get started. Check out our Template Gallery. We’ve listed some of the best hashtags to use to help you promote your contest or promotion.